A vacuum, or pneumatic, glass elevator can enhance the mobility of yourself or a loved one at home while providing panoramic views. Vision Elevators has several vacuum elevators to match your specific needs and your home's design. None of our vacuum elevators require construction of a pit, hoistway, or machine room. They can all be attached to a balcony or go through a hole in the floor. They are designed for residential use only. The Vision 350 vacuum elevator is the smallest pneumatic elevator that Vision Elevators offers. It has a 30-inch diameter, can support up to 350 pounds, and can make up to four stops. 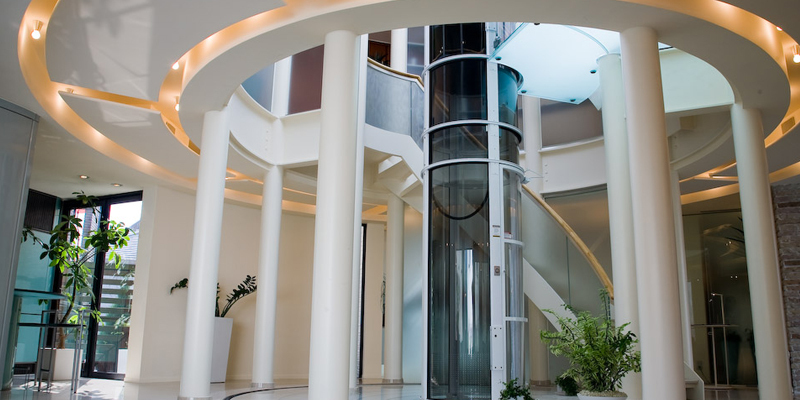 The Vision 450 pneumatic elevator has a 37-inch diameter, which makes it large enough for two people to stand. It is capable of holding up to 450 pounds of weight and can travel up to four stops. Our largest vacuum elevator model offered, the Vision 550, is designed to be wheelchair-accessible. It has a 52-inch diameter, can transport up to 525 pounds, and can make up to four stops. Pneumatic elevators work by using changes in air pressure to move the elevator cab. A vacuum seal is built into the ceiling of the cab. When the rider wants the elevator cab to ascend, turbines at the top of the tube draw air out of the tube in the area above the cab and pull it upward. When the cab reaches the desired floor, steel brakes make it stop and secure it to the landing. When the rider wants the elevator cab to descend, the turbines turn on briefly, which lifts the cab off the brakes. Then the turbines are turned off, which causes the elevator cab to descend slowly. The steel brakes then stop it at the desired level. If you need to improve the mobility of yourself or a loved one at home, a vacuum elevator could be the perfect solution. Call or email Vision Elevators for more information.